FRAME|WORK is a weekly blog series that highlights an artwork in the Museums' permanent collections. This week, we feature a unique sculpture that unites art and science. 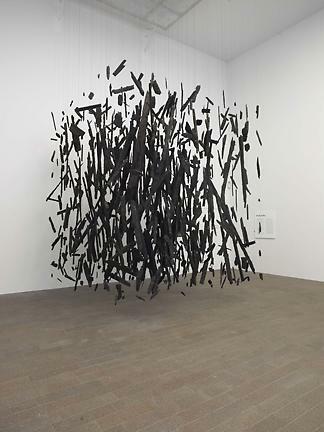 Cornelia Parker's striking Anti-Mass is currently on view at the de Young. Throughout her career, Cornelia Parker’s work has focused on the intersection of physicality and immateriality, weaving together memory and mass. Her work explores the transformation of seemingly durable materials by violent means, such as bombing, lightning or fire. Once the materials have undergone drastic changes, Parker directs the viewer to meanings conveyed by these found objects in both their altered and unaltered states. This sculpture is constructed from the charred remains of a Southern Baptist church with a predominantly African American congregation, which was destroyed by arsonists. After Parker learned of the arson, she received permission to use the timbers of the burned church to make this piece. In the title, Parker (who was raised Catholic) uses the word "mass" as a reference to both the elemental substance of the universe and the sacramental ritual at the center of the Christian faith. In this way, the realms of science and religion are brought together to emphasize the power of creativity over violence and destruction. Parker’s cube appears to defy gravity, the title a witty allusion to this fact, and the sculpture floats ethereally in the air while remaining a monumental object of quiet meditation and reflection. Confronting viewers with the temporal nature of everything physical, Parker captures the spirit of those who previously worshiped in the building until the fire turned it into a testament to violence directed against African Americans. Her work hovers as a miraculous, spectral object evoking both the lost church and the presence of its congregation through an absence more powerful than any figurative image. In celebration of our neighbor the California Academy of Sciences' admission-free day, we encourage you to visit both our institutions, and like Cornelia Parker, experience art and science together! Anti-Mass is on view in Gallery 16 at the de Young (admission fees to the permanent collection apply).